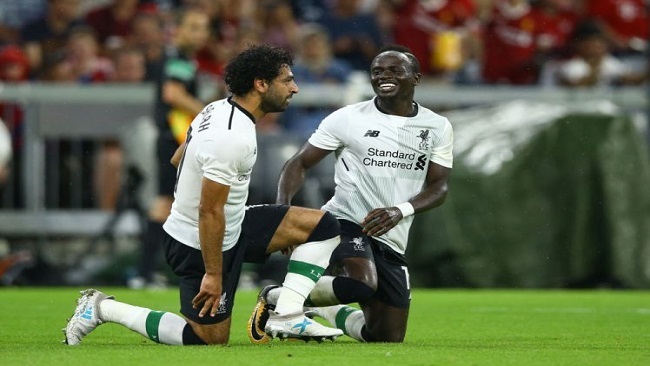 Egyptian Mohamed Salah, Senegalese Sadio Mane and Ivorian Nicolas Pepe shared the glory among the African stars in Europe at the weekend. Salah scored with an unstoppable shot from outside the box to complete a 2-0 win for Premier League leaders Liverpool over Chelsea after Mane had nodded the first goal. Pepe took his Ligue 1 goal tally for the season to 19 by scoring once and also provided two assists as Lille stunned runaway leaders Paris Saint-Germain 5-1. He set Liverpool on their way and settled some nerves after a goalless first half by taking advantage of being unmarked to head in Jordan Henderson’s pin-point chipped cross at the back post. For the 27-year-old Senegalese star it was his 18th Premier League goal of the campaign, his best return in his time in England and a reflection of his often unsung contributions to his club sides. Played a major role in Mane’s goal and added a glorious second minutes later with an unstoppable drive from outside the area for his 22nd goal of the campaign and 19th Premier League strike. The 26-year-old’s celebrations were worth the admittance fee as he knelt on one knee and later kissed the turf. It was a perfect riposte to the Chelsea fans who chanted an Islamopbobic song about him prior to last Thursday’s Europa League clash with Slavia Prague. The Kenyan powerhouse midfielder has found holding down a regular starting position this season tough through a mixture of injury and form. However, he showed his old sparkle in scoring Spurs’ first in their routine 4-0 humbling of relegated Huddersfield, benefitting from Fernando Llorente pulling an opposition defender with him. The 27-year-old Wanyama profited by getting the better of Tom Hamer and slotting the ball home. The Nigerian scored after seven minutes as Villarreal climbed out of the La Liga relegation zone with a 1-0 win at fellow strugglers Girona. However, a tough battle lies ahead for Chukwueze and his teammates as they are just two points above endangered Valladolid. Senegal defender Kalidou Koulibaly bagged a brace as Napoli beat Chievo 3-1 to delay Juventus’ bid to win Serie A and condemn the Verona side to relegation. Koulibaly, 27, headed in the opening goal in the 15th minute and claimed his first double nine minutes from time. “We are angry. We want to show another face of Napoli,” added Koulibaly, following his first goals this season, after losing 2-0 to Arsenal in a Europa League quarter-final first leg. Ivorian Kessie scored from the spot to keep AC Milan in the Champions League places with a 1-0 win over Lazio. Kessie slotted in on 79 minutes to end Milan’s four-match winless run, and stay one point ahead of Roma. The 22-year-old came under fire, however, after the game for holding Francesco Acerbi’s shirt aloft like a trophy along with teammate Tiemoue Bakayoko after the Lazio player had swapped it with French midfielder following the game at the San Siro. The Algerian midfielder returned to action for Schalke for the first time in a month after being dropped for poor discipline. Bentaleb came off the bench in Schalke’s 1-1 draw with Nuremberg to make his first appearance in a royal blue shirt since the 7-0 Champions League drubbing by Manchester City in mid-March. Interim coach Huub Stevens had banished Bentaleb to the reserves for undisclosed disciplinary reasons, but welcomed him back into the fold last week. Algerian international Belfodil was denied his sixth goal in three league games after his first-half strike against Hertha Berlin was wrongly disallowed for offside. The decision was not overturned by VAR because the whistle had already blown by the time Belfodil fired the ball in. Though Belfodil did not make the scoresheet, Hoffenheim won 2-0. The Ivory Coast striker continued his excellent season with a goal and two assists in Lille’s stunning 5-1 thrashing of champions elect Paris Saint-Germain. The 23-year-old gave Lille the lead shortly after half-time by slotting in his 20th goal of the campaign, before teeing up defenders Gabriel and Jose Fonte late on as his side condemned PSG to their heaviest Ligue 1 defeat since 2009. The Tunisian international’s 55th-minute penalty set Saint-Etienne on their way to a crucial 3-0 win over Bordeaux as Les Verts chase a Champions League spot. The 28-year-old has scored 14 goals this term since signing from Rennes.